This story is as old as Pakistan and its history. During the early months of 1947, Mirza Ghulam Ahmed Qadiani, at the wishes of his British masters and certain Hindu leaders, had put forth this request. Indeed, there was no hesitation (on the part of the British) in accepting this request. Subsequently, Muslims were reduced to a minority in Gurdaspur, Ferozpur and Amritsar (provinces), where actually they comprised 51% of the population. This was the driving force behind the unjust division of Punjab. This action not only brought about a historically unparalleled migration and hideous massacre (of Muslims), but also gave birth to the Kashmir problem, which has grown today into an international issue. Another factor that was responsible for this ugly aspect of history was that the interest of Muslims was unfortunately represented in the Boundary Commission by Sir Zafarullah Khan (a follower of Mirza Basheeruddin Mahmood appointed by the British), whose spiritual leader had publicly separated his faith (from Islam) by writing his request to the British Rulers! This incident was linked to a conspiracy hatched a few years earlier and the movement, whose leader was the head of Ahmadiyya Jama'at, Mirza Basheeruddin Mahmood and secretary was (an unsuspecting) Allama Iqbal, created for this purpose. This movement, which is remembered in history as the Kashmir Committee, was established in 1931. Qadianis not only consider their leader, Mirza Ghulam Ahmed Qadiani, a prophet and Promised Messiah, but also it is their belief that Hazrat Eisa(AS) is buried in Kashmir. Thus, Kashmir is an important religious shrine for them. This fact was disclosed by Hakeem Nuruddin who became the first Head of Ahmadiyya Jama'at after the death of Ghulam Ahmad Qadiani. He was the official Physician of Maharajah of Kashmir and researched and published a book in which he attempted to prove that since the grave of Hazrat Eisa(AS) is near Srinagar, they have a right over Kashmir. However, this is a false claim. The well-known historian, Abdul Haleem Sharar, has proven the fallacy of this claim in a book he published specially on this subject. Through historically accurate data, he proved that the grave of the person named Eisa near Srinagar belonged to a Mujahid commander in central Asia, who after defeat in some war, had escaped to that region, and died there. This was the time (1931) when neither the destructiveness of Qadiani fitnah was common knowledge, nor their heretic (Kafirana) belief was known to the public. Indeed, motivated with these intention and aiming for other (destructive) goals, they founded the "Kashmir Chalo Movement" and, to misguide the common Muslims, they nominated Allama Iqbal to a role in its central leadership. But this conspiracy and the individuals behind it, could not escape the sharp eyes of Allama Iqbal for long. (When the true mission of this organization became clear,) At once he (Allama Iqbal) distanced himself from this movement and deflated its balloon. Keep in mind that in those days Qadianis did not use to declare themselves openly separate from Muslims, instead they were eating away the foundation from the inside. From "Kashmir Chalo Movement" to the request to be considered a separate entity from Muslims, and then the unjust division of Punjab by the Boundary Commission, the reason for the devious role played by Ahmadiyya Jama'at was the promise they had received. To make it a reality, Qadianis have continuously been pursuing it seriously. Qadianis were promised that if they declared themselves a separate entity from the Muslim majority, they would be awarded a large region, consisting of two areas of Pakistan - Sialkot and Shakergarh - and Kashmir, which would have (the city of ) Qadian as its center and would be given, like the center of Christianity, Vatican-style (independent) status. Man proposes and God disposes. 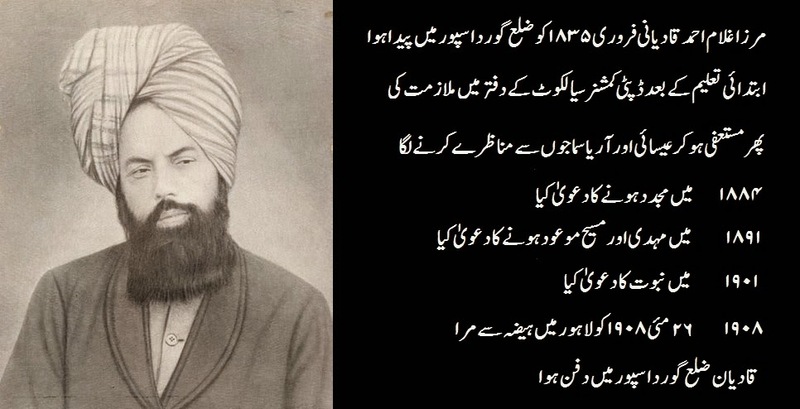 During the disturbances of 1947, Sikhs did not appreciate this subtle point. When they lifted their arms to slaughter Muslims, they were unable to differentiate between Muslims and pseudo-Muslim Qadianis. Thus, Qadianis too were forced to migrate along with Muslims from Qadian, Gurdaspur, Ferozpur and Amritsar. Inadvertently, Sikhs had become responsible for the failure of a cleverly-hatched scheme against Muslims. Indeed, some good resulted from the evil. Even though the scheme to create a Vatican-style city in Qadian had failed, the Indian Government never ceased to bestow favors on this religious creed (Qadianism). During those years when revolt by Sikhs was at its peak in Eastern Punjab, all foreigners including Sikhs were prohibited to enter Punjab. But even during that era, Qadianis from all over the world, including Pakistan, were given complete freedom to visit Qadian, a tiny town in East Punjab, which had become notorious because of Mirza Ghulam's obsession with prophethood. With the Independence of Pakistan and the passage of "Qarardad-e-Maqaased", all hopes of those elements and forces, who in the first place were against the creation of Pakistan and, if unable to stop it, wished to destroy it or steer that newly founded State along their lines (of Secularism), were dashed. These forces included, Qadianis, as well as Christians and certain non-political and political groups. These elements were not at all willing to accept a Pakistan whose identity is only and solely Islam. During the decade when Blasphemy Law was passed, two religious minorities considered it a direct threat to them. Qadianis were on the top of the list, closely followed by the Christians. On this issue, the interests of both minorities became one. Areas of Punjab where Christian population is concentrated consist of the boundary areas of Sialkot, Lahore and Okara. Coincidentally, large numbers of Qadianis are also residing in these areas, due to their proximity to Qadian (in India). Even prior to the creation of Pakistan, the followers of Mirza Ghulam Ahmad had been residing there. The Blasphemy Law thus unified the interests of these minorities and, with the passage of time, an unseen bond was forged between them. This undeclared alliance has resulted an unusual situation. Both groups had deep-rooted connections with the sectarian terrorism that had gripped the whole country and especially Punjab, just before the recently ended Constitutional, Political and Judicial Crisis. * Through well organized planning they have established a network of Non-Governmental Organizations (NGO). The nephew of Sir Zafarullah Khan, Mr. Zafar Chaudhary, has played a special role; additionally, at the instructions of Mirza Tahir Ahmad, Head of the Ahmadiyya Jama'at, the former caretaker Minister of Sindh and retired bureaucrat, Kanwar Idrees, has been providing important services. NGOs, which include Pakistan Human Rights Commission of Mrs. Asma Jahangir, whose husband is a Qadiani, has established relations with various International Human Rights Organization and their Patron Agencies. Focusing on Pakistan's (Blasphemy) laws and other human rights issues, they have began a propaganda campaign against Pakistan, which is still going on in some form. * Another front (used by them) is terrorism. If we take a cursory view of sectarian violence (against Muslims), it becomes obvious that most incidents have taken place in areas where these two minorities are concentrated. Recently, trusted individuals have presented the Government of Pakistan a report, which reveals that the Indian Government has established a (terrorist) camp in the town of Qadian, in East Punjab. Running under the control of RAW (Research and Analysis Wing), the Indian Intelligence Agency, (non-Muslim) Pakistani youths are being trained there for terrorist activities. The Report states that these young men, who are sponsored by Jama'at Ahmadiyya to Qadian, are Qadianis/Ahmadis, as well as Christians. Before departing for Qadian and upon their return, these men reside in the houses of Qadianis and Christians living in border areas. They are given basic information and training there. It is also revealed that after committing the crime, terrorists hide in these areas, as well. It should be noted that the distance from Shakergarh to Qadian is not more than 20-25 miles. Shakergarh (and its adjacent areas), Oxford (in Surrey, UK, where Ahmadiyya Headquarters is located) and Qadian makes a triangle from where all Sectarian Terrorism (against Muslims) is being launched in Pakistan. If the record of movements of Qadiani leaders in these areas is charted out, a strange pattern comes to light. This Report further has mentioned certain names and its allegation has created astonishment and perturbation in Government Circles. Investigations are going on at an unusual space in this regard. The Report has reemphasized the common knowledge of ties between Jama'at Ahmadiyya and India, Israel and Christian World; therefore, no surprise was ever shown at this. However, (the Report states that) after the passage of the (Constitutional) Law in 1974 declaring Qadianis non-Muslims and the promulgation of Blasphemy law during the reign of General Zia ul Haq, these contacts have tremendously increased and so did the sectarian terrorism and Shia-Sunni violence and bloodshed. These connections reached their climax in 1984, when Mirza Tahir Ahmad suddenly escaped to London. Since then, establishing links, planing, and their execution have become more efficient and rapid. The Report has also shed light on the influence of Jama'at Ahmadiyya on Pakistan's Administration and Politics as well as on their leader, Mirza Tahir Ahmad. When Pakistan came into existence, the Qadianis flooded bureaucracy and were numerous and influential in the Armed Forces, as well (Thanks to Sir Zafarullah Khan) This resulted in a very unusual situation particularly in the bureaucracy. Jobs and promotions were granted only to those who were either Qadianis or were recommended by Jama'at Ahmadiyya. Those who could not get the recommendation or considered it wrong, remained jobless or without promotions. It was during the same period when the first movement against Qadianism began in Pakistan, i.e. 1953. The Report has mentioned that this was also one of the factors for the onset of Tehreek-e-Khantme Nabuwwat, which had created lot of financial repression all over the country especially in Punjab. Regarding Mirza Tahir Ahmad, it is mentioned that, at his hands, Jama'at Ahmadiyya has grown active in politics, whereas it considered itself lacking in this field earlier. When Zullfiqar Ali Bhutto was laying the foundations of Peoples' Party, Mirza Tahir Ahmad was one of his close associates. In these days, Mirza Nasir Ahmad was the head of Ahmadiyya Jama'at, but he was a weak and shy individual. He did not want that Jama'at Ahmadiyya should create for itself opposition by interfering in Politics. But against the wishes of Ameer of Jama'at, Mirza Tahir Ahmad developed influence in Peoples' Party. Then Mirza Tahir (became more vocal) and it became apparent that that young man was an astute and aggressive individual, calling for armed activities. Even during the lifetime of Mirza Nasir Ahmad, Mirza Tahir had made the political wing of Jama'at so active and strong that the Ameer of Jama'at became helpless. Mirza Tahir was so close to Bhutto that when he (Bhutto) took control of the Government, his (Tahir's) position became that of an important political adviser and de facto ruler. At that time, Qadianism had become very influential. Earlier, in 1965, this element had conspired to annihilate Pakistan by initiating a war with India through Bhutto. Once again, their aim was to establish the separate state they had dreamt since the 40s. Now, the same group had attained much influence in the government. However, the country loving religious (Muslims) individuals, political parties, and the armed forces had grown alarmed (by they influence and activities) and the military intelligence itself began preparing reports about their elements in sensitive posts and their activities. A short while later, a forceful popular movement was born and forced Bhutto to declare them non-Muslim. At that time, several people occupying sensitive (government) positions either absconded from the country or resigned from army and other departments; and those who had become Qadiani, due to pressure or financial incentives, reverted back to Islam. One such example is a famous family from Jhelum whose son, Raja Manawwar, announced that he is a Muslim. His two brothers, Raja Mansoor and Raja Basit were in the Armed forces and the third, Raja Ghalib was the Director of Education in Punjab. This and several such examples make us believe that if Islamic scholars adopt a wise and honest and whole-hearted approach and the Government controlled media also support them, there would be no reason why thousands of Qadianis would not revert back to Islam. The majority of them neither know the real motive of this religious cult, nor have any knowledge of their activities. It has been suggested that if they are approached with affection and sincerity, then good success can be achieved, because many of them are in search of the truth and loving of the country. However, no attempt has been made to approach them properly. It should be noted that after the tragedy of East Pakistan, the information gathered by various intelligence agencies on Jama'at Ahmadiyya's political wing, has once again revealed that this creed strives to create a state, by the name of Qadian or some other suitable name, which would operate on the pattern of Vatican. It has also come to light that India has always supported them in this goal and has reassured them that, if through their effort and planning they succeed in seceding the boundary areas of Sialkot and Shakergarh, then Kashmir along with Qadian and adjacent areas will also be bequested to them where they can form their self-administered government or state. The Report further mentions that, during the 70s and 80s, in same way as they had done with Christians, Qadianis had sought cooperation by Shias and Ismailis, but had failed in their attempt. For the last two years, through Mrs. Asma Jahangir and other so-called Human Rights campaigners, they have tried to defame Pakistan on the grounds of poor human rights records. Zafar Chaudhary (the nephew of Sir Zafarullah Khan Qadiani) has been behind these efforts. At the same time, sectarian terrorism has been rekindled in Pakistan and a few Qadianis and Christians were also killed, so that the basis of its law on blasphemy, Pakistan can be defamed at International level. Through several references, the Report has proved that this element has been involved in the violent murders of the past few months leading to the present Constitutional, law and Judicial crisis. To create the present crisis US$320.000.000/- has been spent and the distribution and utilization of this huge amount has been controlled through them. The primary objective of this crisis is to deliver a fatal blow to the ideological identity of this country, so that instead of an Islamic State, it should become a secular state. In such an instance, not only its international role but its defense capabilities will also suffer. * Firstly attempts should be made to abolish the 1973 constitution. * If constitution can't be abolished, then at least the entire 8th amendment should be canceled. * Lastly, attempt should be made to get (at least) the Second Amendment (which had declared Qadianis as non-Muslims) abolished. To achieve this goal, attempts should be made to promote secular leaders in both Political and Military services and ensuring their success. This has also been the basic aim of present crisis. The person whose name has been suggested for a certain high level position in the caretaker setup for the next two years, is purely a secular personality in his pronouncements, actions and character. A question has raised as to whether such a person, who is not only of unacceptable ideologically but also has certain moral flaws, can he be constitutionally given a responsible position, particularly in the Judiciary, in a state like Pakistan? The Report has moreover mentioned that Qadianis are somehow behind every crisis in this country and it should not be ignored that this time they had been very vigorously active, as well. Recent statements of Mirza Tahir also attest to this role. The Report has also mentioned that regardless of whether India gives them East Punjab town of Qadian, adjacent areas and Kashmir or not, they will pursue their efforts in creating a Vatican-style independent state. There has been no change in their stand and aim on this issue and for it they have solid backing and help from India, Israel ,and the Christian World. 1. Mirza Tahir's visits to India and his meeting with Indian authorities in London should be closely monitored. 2. Connections and activities of Peoples Party's leaders should be monitored. These include Khalid Kharral (who spent 2 years in India) Aitizaz Ahsan, Aftab Ahmed Sherpao, and Naheed Khan. 3. Serious attention should be paid to the easy grant of political asylum to Qadianis by Britain and other countries of Europe (America and now Far East) and this issue should be carefully and cautiously raised at diplomatic levels. 4. Activities of organizations working in the name of human rights, their office bearers and patrons like Zafar Chaudhary should be watched. In particular, their financial transactions should be regularly and thoroughly investigated. 5. Activities of Qadianis and Christians in Sialkot, Shakergarah, and other adjacent border areas should be closely watched. It is through these areas that young men are sent to India to receive training for terrorist activities and then return. These routes should be closed and activities of the families, who give protection to terrorists and provide facilities for them, should be closely watched. 6. During those days when incidents of terrorism increases in different parts of the country, the movement of terrorists in these areas is also increased. After committing the crime, terrorists escape to the neighboring country through these routes. If these areas are closely watched during such periods (of violence/violence), these terrorists can be easily apprehended. Such arrests can lead to horrifying discoveries about the network of terrorists and their supporters.